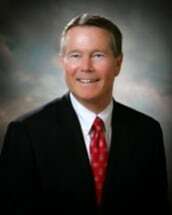 Garvis L. Sams, Jr., Managing Partner of Sams, Larkin, Huff & Balli, LLP has practiced law for thirty-five (35) years and is admitted for practice before the Georgia Supreme Court, Georgia Court of Appeals. U.S. District Court, U.S.Court of Appeals (Eleventh Circuit) and the United States Supreme Court. His leadership within the community and of Sams, Larkin, Huff & Balli, LLP continues the tradition beginning in 1956 by Mr. Sams' father, Garvis L. Sams. Sr., whose law practice was also located in Marietta. Georgia. Mr. Sams, a lifelong resident of the City of Marietta has three (3) grown daughters a grandson and resides there with his wife, Cloma. Mr. Sams is experienced in all areas of general civil trial practice and handles real estate litigation, construction litigation, eminent domain proceedings, estate planning and administration, rezoning and entitlement matters and land acquisition and development issues. Additionally, Mr. Sams and other attorneys within Sams, Larkin, Huff & Balli, LLP are registered lobbyists in the State of Georgia and have represented local governments in zoning and condemnation matters, tax issues, civil litigation, risk management and personnel matters. Mr. Sams was named one of Georgia's Super Lawyers in the field of Land Use/Zoning in 2011 and 2012.